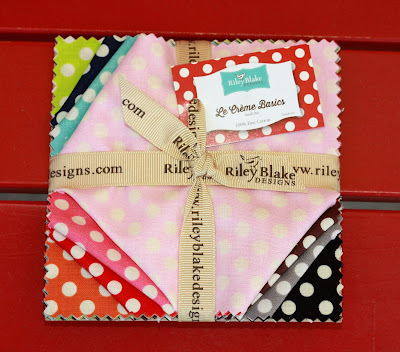 Quilt Taffy: Polka Dots! - Giveaway Day! Polka Dots! - Giveaway Day! 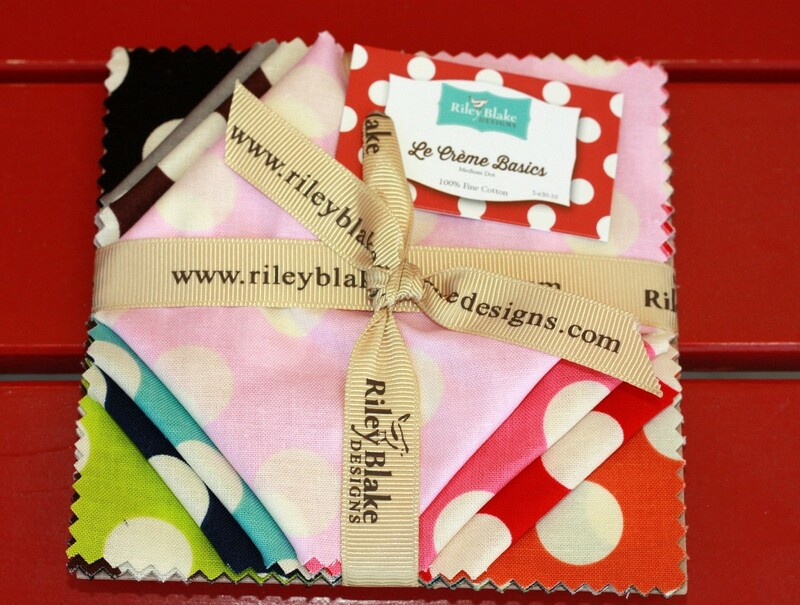 Some Riley Blake Flannel Fat Quarters! Big Medium Dots on cream. some just plain old White ones too. Riley Blake pack you would like. Love, love any dots! The cream bitty color dots are great. They are all great but I love the Swiss dots! Bitty dots all the way! I have the hexi bug and can't stop making the 1" size! Those cremy Swiss dots are gorgeous!! The Swiss Dots are too cute! I like the 'geekly chic' pack!! Oh the swiss dots are so cute! I like the swiss dots most. I love dots. Love, love, LOVE them! All of them. But the swiss dots are most beautiful! Thanks for the chance! I like the small cream dots. I made an orange version of your Poolside quilt this week. It was fast and it is so pretty. Going to give it to a college freshman from Syracuse University. They are all about orange! The small cream dots are my favorite. I am a sucker for polka dots! I like the small cream dots. Thanks for sharing. Le Creme! Just because I like the way It sounds! I just love everything with dots. oh my! Dots are awesome but that charm pack of Santas Workshop is GORGEOUS! I like the Big Medium dots on Cream. Lovely giveaways. I would like the Le Creme Basics. Thanks so much for the chance to win. I like the merry little christmas - and that has dots in it too! thanks! I like the Small Cream Dots. Thanks for the chance to win! oh, the medium cream dots for sure! Lovely! love polka dots! Small cream dots would be my pick. I love the small cream dots. Thanks for the chance to win. As much as I love dots Puppy Park would be my choice, my grandson loves dogs and this would be the start of a new quilt ofr him. Ohhh the choices...I love them all!! But would go for the large white dots...thank you for this chance. I love dots! I would pick the Small Cream Dots. Thanks for the giveaway! I love the small cream dots. 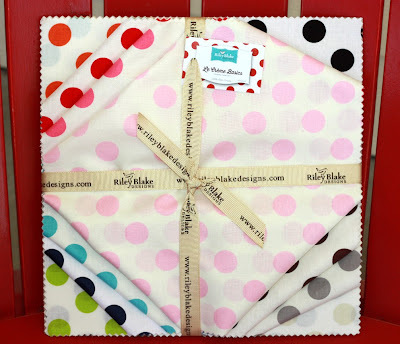 I love polka dots they are brilliant in any project. Sort of like a really fancy plain fabric!! I would love to have the Cream Dots (the big ones!) Those are such fun! I like the medium and large dots. Actually I sort of collect all dots. I love them all! I like the small cream dots! I like the bright La Creme. Little creme bitty Swiss Dots are awesome - in fact they ALL are!!!! I like the tone on tone or small white dots best. Small cream dots for me. Thanks so much! I love polka dots, cream, white, tone on tone, I would find a quilt project for any of the above. 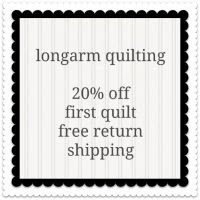 Thanks for being so generous with the Give-Aways to all quilters. It is certainly appreciated. I would love the big medium dots. Thank you for the giveaway. Ladybug Garden or small cream dots would be my picks. Thanks! I love polka dots. Think the medium ones (cream dot) would be my favorite. The dots are so cute, but I like Ladybug Garden, too! Thank you for the chance to win! Love the Big Medium Dots on cream...thanks for the chance! I love any and all polka dots! Some day I want to make a quilt using all dots! I love the small cream dots! Thanks for the chance to win. The Swiss dots. Reminds me of some things my Mom made for me when I was a little girl. Love the medium dots on cream....thanks! So hard to choose, but it would be Geeky Chic even though I love dots!! I'd love Cream MEDIUM Dots Le Creme Basics Charm Pack please! Very hard to choose... I think the tiny cream dots are my favorite though! I'd like the small cream dots :) Thanks! Any dots would be fun..but think I'd chose the small cream dots! Seems like they are a favorite choice! Small cream dots would be perfect in the flower garden I'm working on. Love dots! MEDIUM Dots Le Creme are what I'd choose probably. I would definitely choose the rich colour background with the creme dots! Rich color dots for me! My fav are the 10" Swiss Dots (cream background). Thanks for the giveaway! Oooooo the little bitty creamy Swiss dots are adorable! I would love the medium dots. Thanks for the chance to win. Oh I love the medium cream dots! 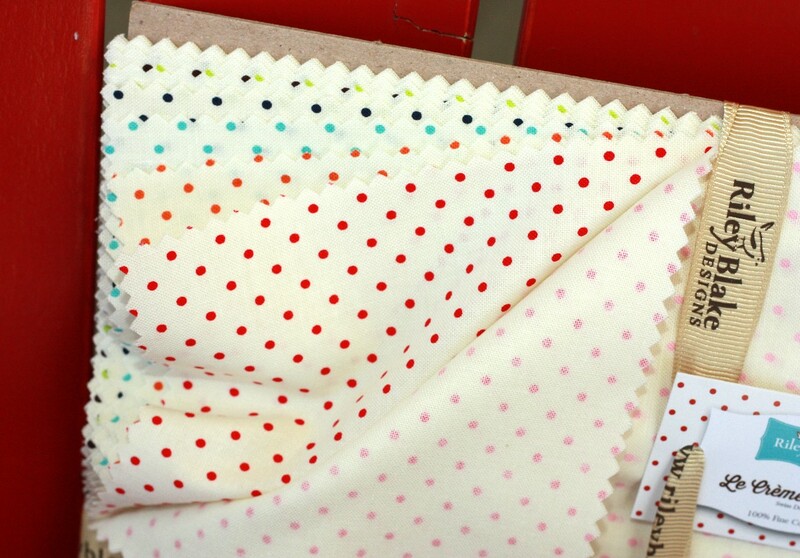 Any kind of polka dot fabric reminds me of my Grandmother. She used to sew her own clothing, and her favorite combination was navy blue background with white polka dots...very classic! I love little bitty Swiss Dot, sounds like something that needs whipped cream on top! Thanks for the inspiration. I love the Cotton Small Dots. Polka dots are so fun. Love the big dots. Would love to win the small cream dots! Thank you. Santas Workshop looks great - I love the colors instead of the usual red and green for Christmas. Love the small cream dots. Thanks for the chance to win. I love dotted fabrics. I'd pick the cream medium dots. Oh the Le Crème tiny dots! Oh I love dots so much! Medium, small or swiss..really love all of them! I have no dots in my fabric stash, I would so like to try some and I really like the looks of the large cream dots on the rich colors. There's just 'something' about dots that makes me smile!! I love the Little bitty Creamy Swiss Dots!! Thanks for the chance!! I am a polka dot fanatic. I love them all! I would pick the small cream dots or maybe the medium ones....ohhh thehard choices to be made. I'S SELECT THE LITTY BITTY SWISS DOTS! I have lots of little dots so my pick would be the medium dots on cream. Thanks for the give away. I do love all the dots but Merry Little Christmas would be my choice. Thanks! Love the Swiss dots! thanks for the giveaway! Geeky Chic, all the way. I would love to win a pack of the small white dots. Thank you so much for the opportunity to enter your drawing! Great colors! 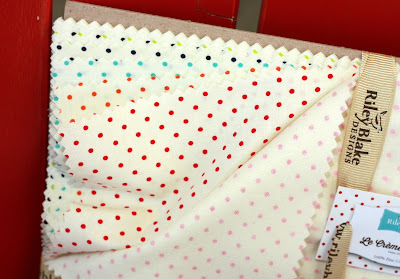 I like the big colored dots on the cream fabric. Thanks! Little bitty swiss dots... so pretty!!! Bright colors with the big cream dots! I like the small Swiss Dots. im loving the swiss dots!!!! I would love Geekly Chic. Love the fun prints. Love all dots... medium size I think! I think it would be Kensington for me. I love the polka dots at the top -- the color on color -- but my second favorite would have to be the white dots on colors -- medium. I love them all, but the itty-bitty dots are the sweetest! I'm feeling rather dotty today! :) I like the itty bitty dots. I'd love the small cream dots! I would like the small Le Creme dots please!But they are all fantastic! They're all incredibly tempting, but I love Le Creme Basics most. Thanks for the chance to win! I like them all, but I think the small cream dots is my favorite. I like the medium dots. I would choose Pot Luck charms. Little bitty creamy Swiss Dots. They are all adorable. I love Kensington, but if it has to be from Le Creme, I would love the tiny Swiss dots!Thanks for the chance to win! I'm loving the Geekly Chic Pack! Oooooh, Small Cream Dots - how much fun are those! 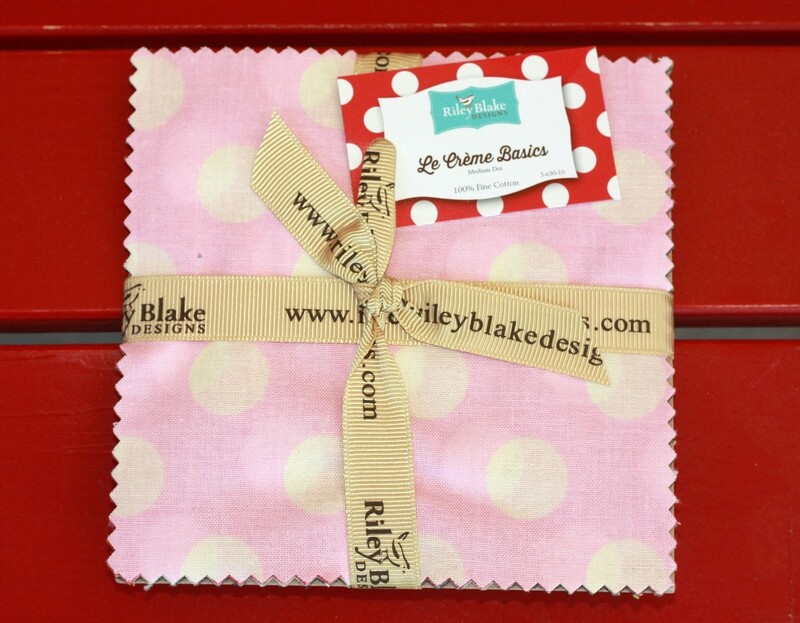 Love a good polka dot! Which begs the question: is there a bad polka dot?? Tought choice! I like Merry Little Christmas and Geekly Chic, but I also love all the dots! 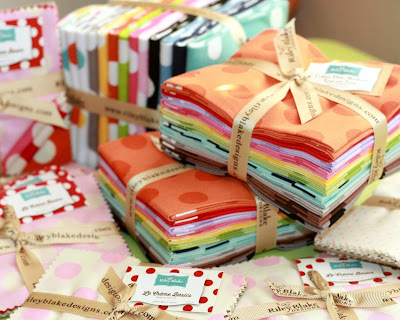 So pretty and I would be thrilled to have any of them, but would chose the big cream dots. So colorful and fun! Thanks for the chance. I would gladly take any of them, ANY... but I do like the little swiss dots! 5 inch charm squares of Millie's Closet is what I would like, please! small cream dots, all are darling though! I have a polka dot obsession. Right now I'm working on a circular medium dot on white. Haven't tried any in flannel yet. With two babies due in he family, the flannel would be perfect. I have always loved polka dots. The small cream ones are my favorite ones featured here. Thanks for a chance to win. Hope it is cooler there than it is in Missouri right now. I like the Cream Dots best from all the polka dots. 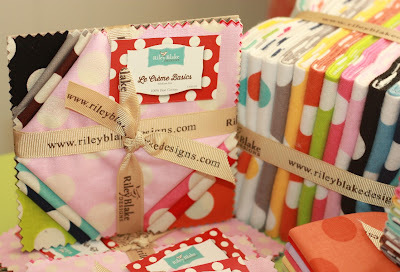 Out of all the charm packs in your shop, I think Millie's Closet would make a beautiful quilt! Such a hard choice but I'd probably go with the small cream dots. So pretty! Thanks for the chance to win. Love the swiss dots. Thanks for the giveaway. Oh man! Dots are my favorite. I don't know if I can pick just one. I want them all. If I must then I would pick........um.....um.....medium dot on white......um I think. Like the saying goes...go big or go home, I want the big dots! I would like the Swiss dots, please. Thanks. I adore dots, especially the Swiss dots! Thanks. What lovely dotty dots! Close your eyes and pick one for me if I win! Cream swiss dots is my favorite - I also like Ladybug Garden. The small cream dots are the best! (The last set you mention.) Those are so cute! I like the small cream dots. Thanks! I like the little bitty swiss dots. 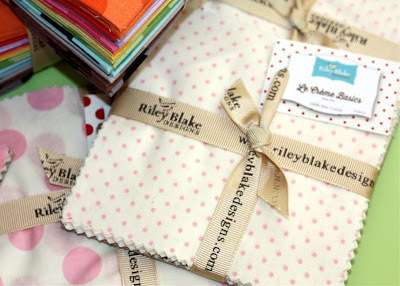 I do like the small cream dots in the dot department and I also like the Little Matryoshka charm pack from Riley Blake, too. I really like the small cream dots pack. Any kind of polka dot is fabulous! I like the cream medium dots. Golly, they're all so cute! I guess I like the flannel dots the best, but only just a smidge more than the cream dots. Thanks for the chance to win! I really like the medium dots on cream. Thanks for the chance to win! I like the Medium dots on cream, they're fun! Adore the itty bitty swiss dots. I even tagged it so that when they arrived at an online shop that I got a notification. Love the creamy swiss dot. Thanks for the dot give away!!!! I love the medium dots on cream!!!! They are all pretty!!!! I like little Bitty or small dots.. 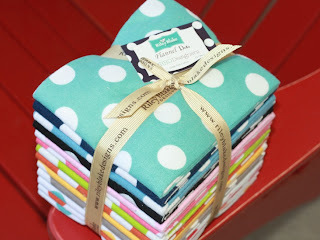 I would love to make pinwheel blocks with these dots with a white background! Thanks for the chance! Big Medium Dots on Cream. You're so sweet! Thanks for the giveaway! I love polka dots!! 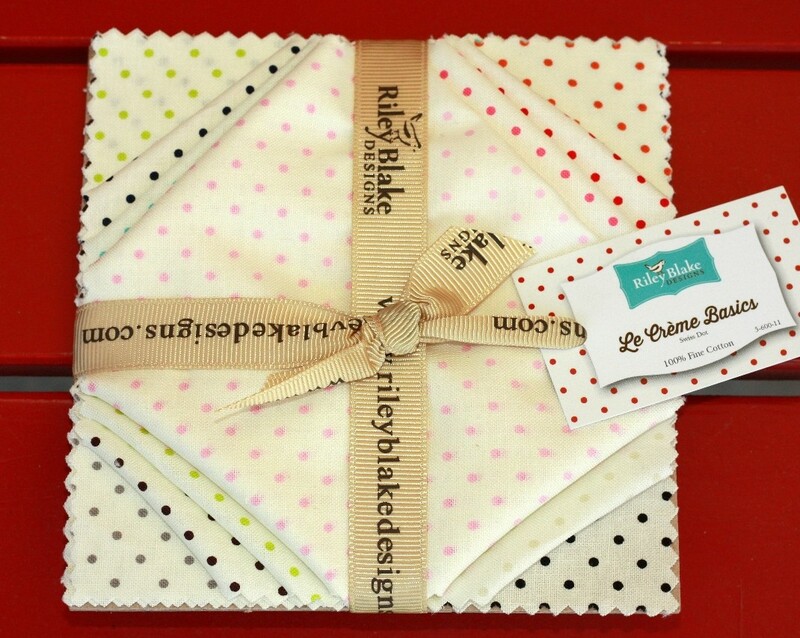 I would love to win the colored background with small cream polka dots!! Oh can I start dreaming about what I could make with it!!! My favorite is medium dots. Whether they be white dots or colored dots, I love dots. Ohh La La!! Love the large cream dots. Ya'll! My favorite is Santa's Workshop. The cream dots are wonderful! Little dots, big dots, cream dots - love all of them! I would love to have the Le Creme Basics small dots! Le Creme Basics SMALL Dot :O super cute! I just love polka dots! The small dots are my favorite. OH, my...so much to love: polka dots, charm packs, Riley Blake! If I won, I would pick the little 3.5" Bake Sale squares. I love the dots, the little bitty creamy Swiss dots. I'd love Geekly Chic - so much fun! Thanks for the chance! My favorite is the solid colors with white dots - the flannels!!! Le Creme Swiss little dots? I also really like Millie's closet. They are all wonderful but I'd go with the Small Cream Dots. Love the little bitty dots! So sweet!